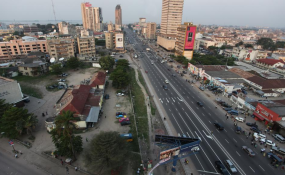 The announcement marked the latest step in a two-year saga of vote delays in Kinshasa. The presidential election is meant to mark Congo's first democratic transition of power. The Electoral Commisison (CENI) in the Democratic Republic of Congo said on Thursday that the country's long-delayed presidential election will likely be postponed again. Set to take place on Sunday, the run-up to the vote had been marred by escalating violence. Presidential candidates were told at a meeting called by CENI Kinshasa that sectarian violence, a warehouse fire that destroyed vote counting machines in Kinshasa, and the risk of spreading an Ebola outbreak in the eastern part of the country were the key reasons the vote had to be pushed back again. The destruction vote counting machines in a fire prompted massive protests, particularly from students at Kinshasa University as the government has simultaneously clamped down on opposition rallies. The clampdown was partially orchestrated by Emmanuel Ramazani Shadary, a former interior minister and President Joseph Kabila's hand-picked successor. The election has already been postponed several times since 2016. President Kabila, who is supposed to step down after the vote, has been in power for 18 years after succeeding his assassinated father. His succession would be the first democratic transition to take place in Kinshasa since its independence from Belgium in 1960. Two major conflicts in Congo have claimed millions of lives since 1996, and fears of renewed violence have gripped the nation for two years as the vote continues to be delayed. CENI said that the new date for the election was December 30.